It is very common that people out there suffer with ongoing, chronic neck pain and aching in between the shoulders for months or even years. Even though they may have consulted 3-5 providers looking for a solution to their pain. 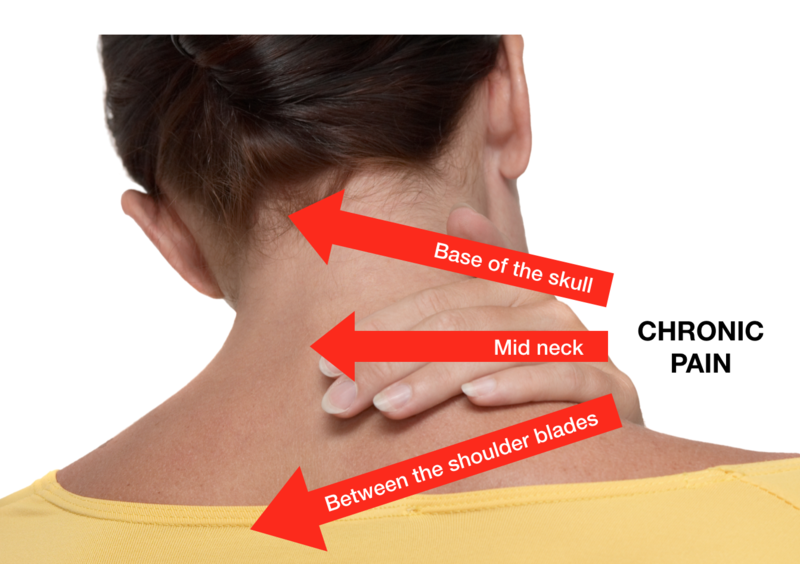 The most common areas of chronic pain are between the base of the skull, down through the middle and lower posterior neck and into that area between the shoulder blades. Patients often report headaches and problems turning their head to check their blind spot while driving. They also commonly suffer with stress and poor postures. Whether it’s that you’ve always had bad posture or your job requires that you sit and stare at a computer all day. The details matter in chronic, life altering neck and shoulder pain. That is why I have engineered our unique 3 step process to completely and accurately identify the cause(s) of your pain. History Consult – We sit down and talk through your entire case. If all of the facts indicate that your pain is musculoskeletal and that I can help, I’ll recommend you progress to stage 2. Between stages 1 & 2 it is vital that I have time to process the information gathered on your History Consult and formulate a differential diagnosis list. Exam and Diagnosis Consult – Expertly designed examination that is tailored to your problem and assesses for your exact diagnosis and rates the complexity of your case. Once a thorough diagnosis is reached and we have all the facts on board I will present the findings to you in easy to understand language. If your pain is something that I can help with I will recommend a plan of action. Treatment Consults – Only after going through my process will we begin to apply expert treatment. Treatment involves high level manual therapy, advice and exercises where needed. Knowing what is wrong first. So we can apply the best solution to your pain.